While we have pretty much at this point grown used to Buffy playing the fearless and seemingly invincible slayer, this week things are mixed up when Buffy is struck down with the flu, which soon leads to having to confront her fear of hospitals when she has to be admitted. Things of course take a turn from the strange when she discovers that a monstrous presence in the hospital is preying on the sick children. Yes this is another of my favourites a phrase which being the fanboy I am is no doubt getting used far too much in these reviews, but I say blame the showrunners for making so many great episodes!! Still from the hospital setup and great camerawork which really maximises the mood of the setting through to the genuinely creepy monster design we get here, this episode really brings something new to the show rather than having the gang just chase another monster around Sunnydale. At the same time the fact that it’s a vulnerable Buffy who is going to have to stop the monster due to a combination of her illness aswell as memories of her cousin Celia dying in hospital when she was a child under mysterious circumstances. Opening to Buffy attempting to continue her patrols despite suffering from the flu, we are quickly reminded that Angel is never far away as he attempts to kill the weakened slayer only to be stopped by Xander, Willow and Cordellia ganging up on his, which really doesn’t do a lot for his supposed dangerous side when he can be subdued by three barely experience non-slayers. Still these mis steps with his character only continue throughout the episode as he turns up at the hospital with all the air of a comedic villain, rather than the dangerous big evil he has been set up for the season as being. As such Angel’s appearance here are mainly for mild comedic effect and as more of a mild irritance than any kind of real threat to the group. What the episode does however surprise us with is a tougher version of Xander, who really steps up here as the group leader in Buffy’s absence, even winning a stare down with Angel when he shows up at the hospital, not being bared from entry due to it being a public building and leading to one of the best exchanges of the episode. Xander: Visiting hours are over. Angelus: Well, I’m pretty much family. Xander: Yeah. Why don’t you come back during the day? Oh, gee, no, I guess you can’t. Angelus: If I decide to walk into Buffy’s room, do you think for one microsecond that you could stop me? Xander: Maybe not. Maybe that security guard couldn’t either. Or those cops… or the orderlies… But I’m kinda curious to find out. You game? Angelus: Buffy’s White Knight. You still love her. It must just eat you up that I got there first. Xander: You’re gonna die. And I’m gonna be there. Its unquestionably fun to see Xander stepping up as the leader of the especially when he’s seen as the comedy relief and general rock of the group, but here we get to see those leadership qualities which will go on to serve him well when he becomes the leader of the Slayer army in the comics which carried the series on after it ended its TV run. 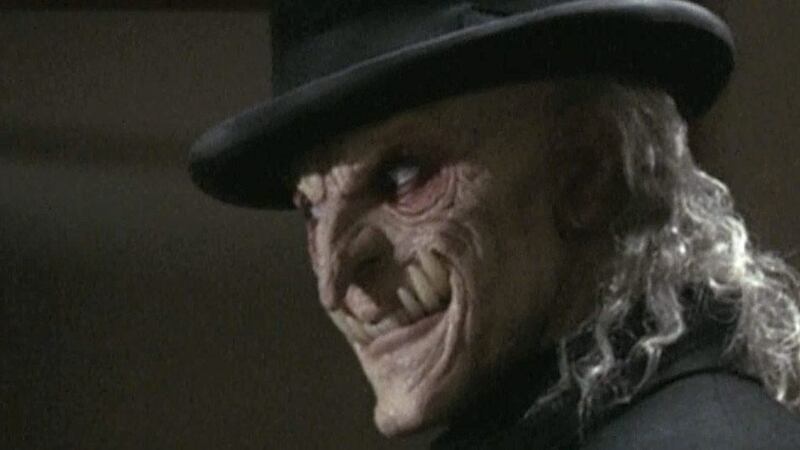 The demon of the week Der Kindestod (Geman for “The child’s death’) is a great creature design with his snaggletooth visage and his fedora and trench coat combo. The fact that he’s invisible to anyone who’s not sick only makes him more of a terrifying threat and meaning that Buffy has to intentionally make herself sick in order to fight him, which of course leaves her instantly at a weakened disadvantage going into the fight. This is of course without mentioning the worm like tendrils which come out of his eyes in possibly one of the more shocking moments of the series, along with the death of Dr. Backer who falls foul of Der Kindestod and we get to see being torn apart by an invisible force. The only issue I have with this episode are the aforementioned Angel interludes, whose appearances here only felt like they took away from the tension of the episode, especially when surely he should be meeting with his vampire realtor and finding a new lair after Giles burned the factory down on the previous episode. Alas here he is instead generally aggravating the Scoobies and failing to cash in on a valuable opportunity to kill Buffy. This aside this is another season 2 classic.